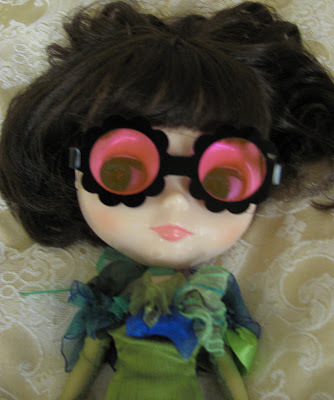 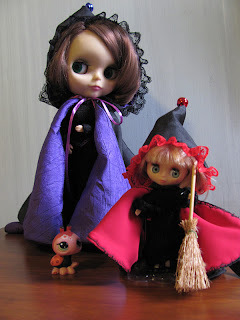 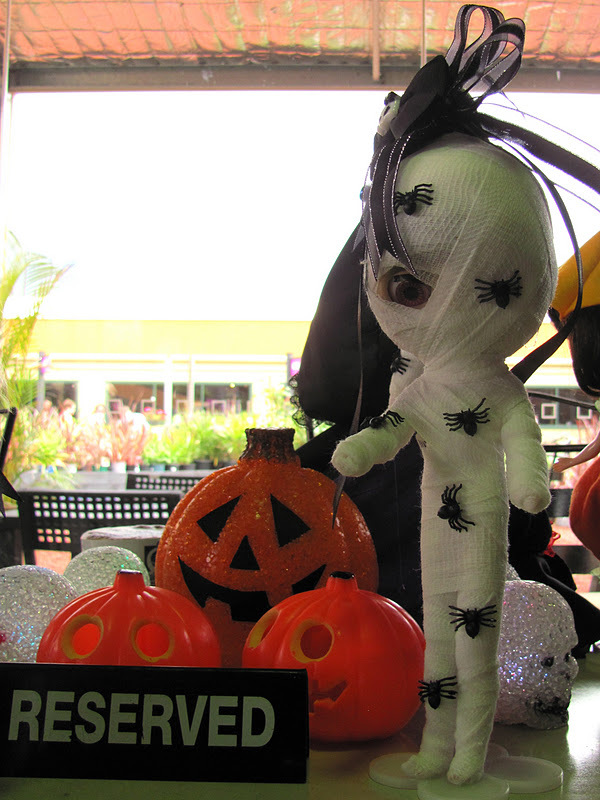 The Blythe dolls are having a great Halloween with lots of dressing up. 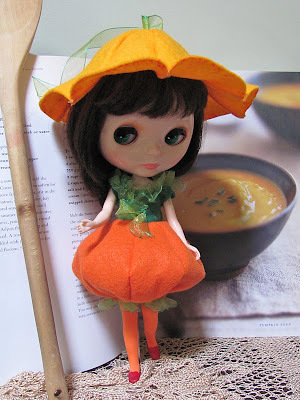 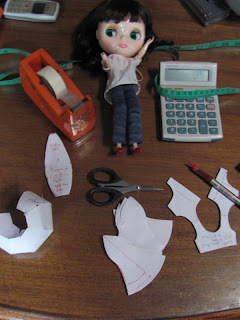 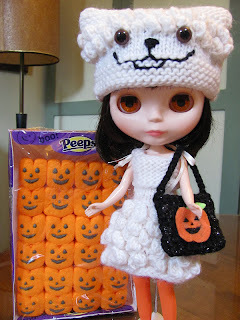 I organised a Halloween / Back-to-School (USA)) swap with fellow Blythe doll people on Ravelry - love doing swaps of clothing for Blythes, it is really inspirational seeing what everyone creates. 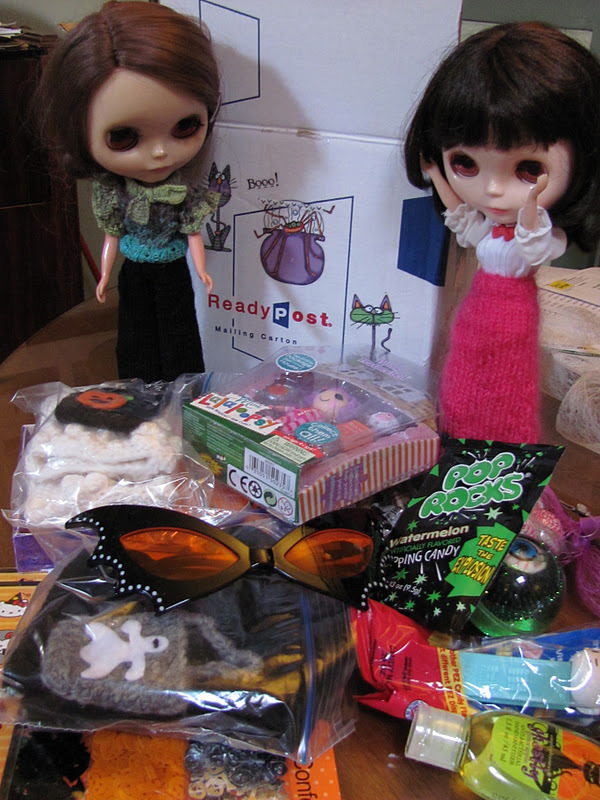 - sending a box full of spooky lollies and fun stuff. 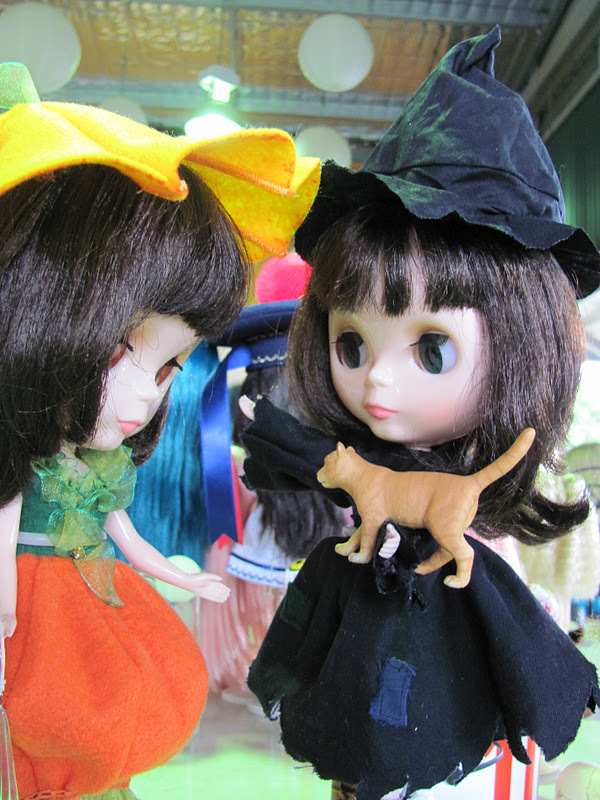 The Dolls were quite overwhelmed. 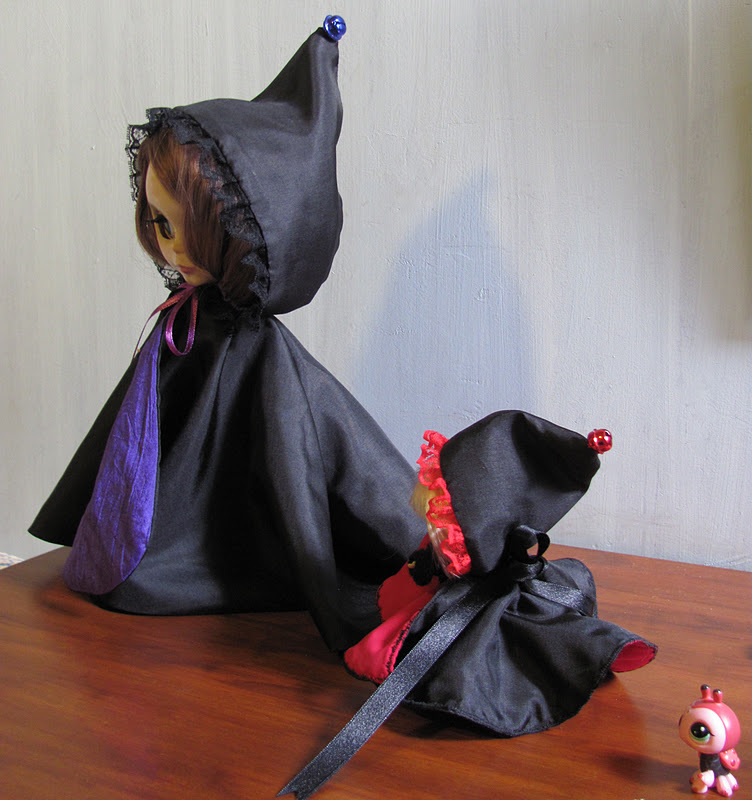 I made my partner only 1 costume and that does make me feel a bit mean but it was elaborate and took quite a bit of making. 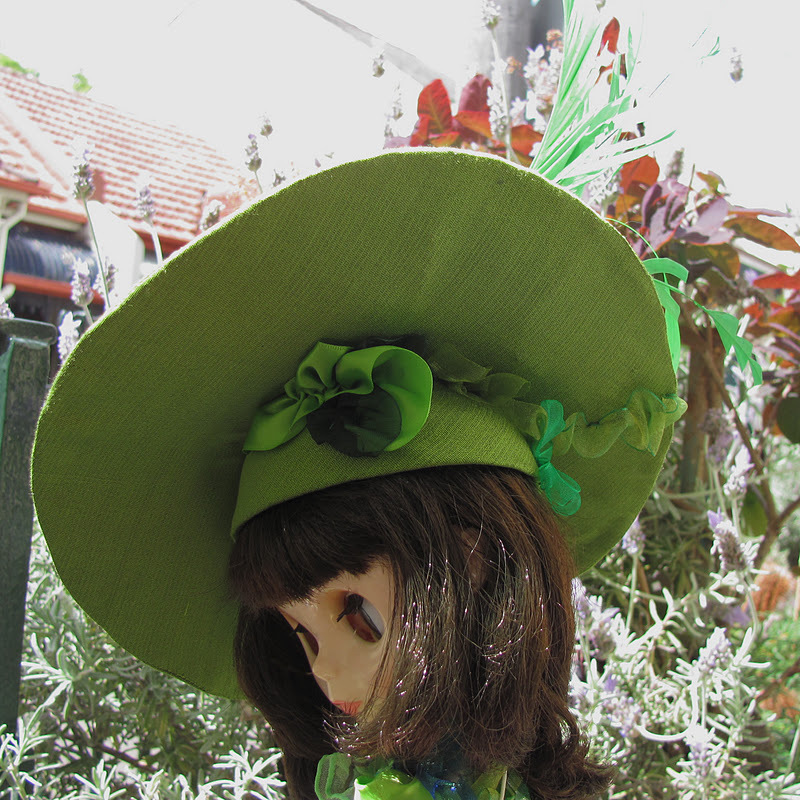 This outfit is based on a couple of costumes from the Emerald City scene of the musical Wicked. 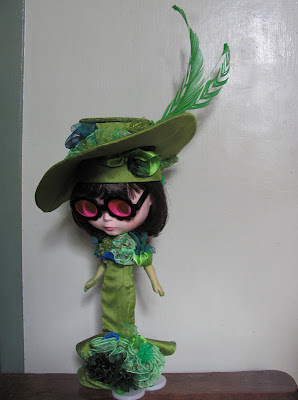 I missed out on sewing costumes for Wicked and took this swap as an opportunity to make something (in small scale) that otherwise I might never get the to sew. 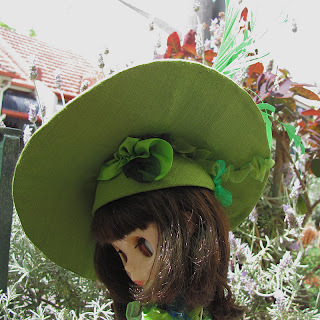 Bought the glasses and shoes - made the dress, hat, tights & gloves. 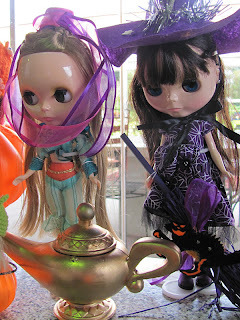 Lots of ribbons & loads of fun. 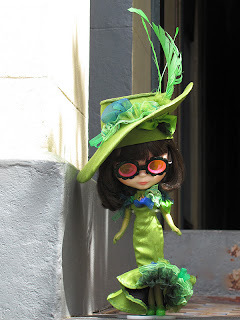 Audrey is doing the modelling here but the doll who is now wearing the outfit is a CanCan Cat and she has bright blue hair - which looks perfect with this costume. 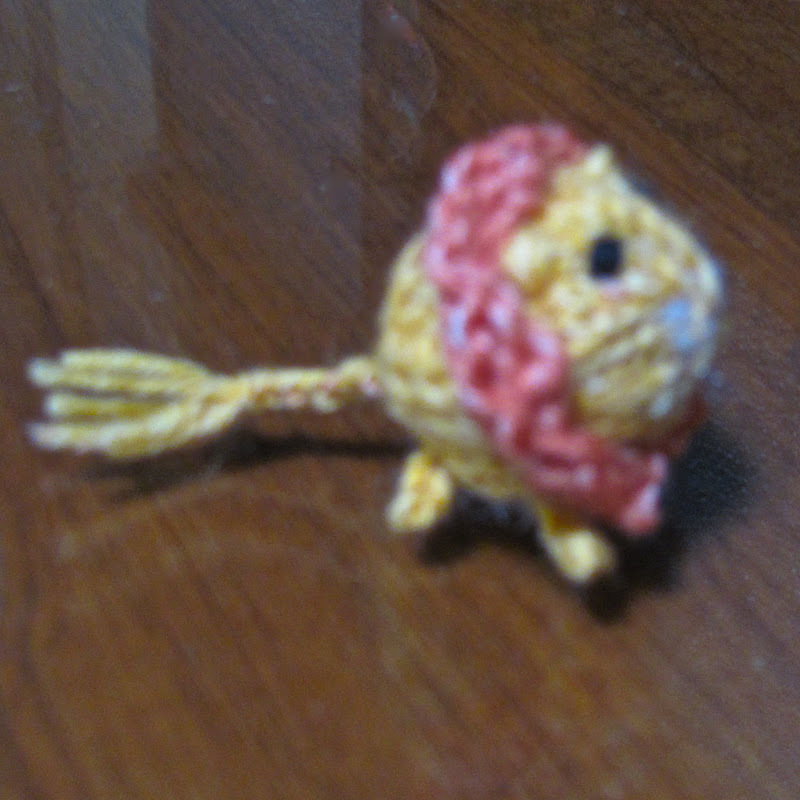 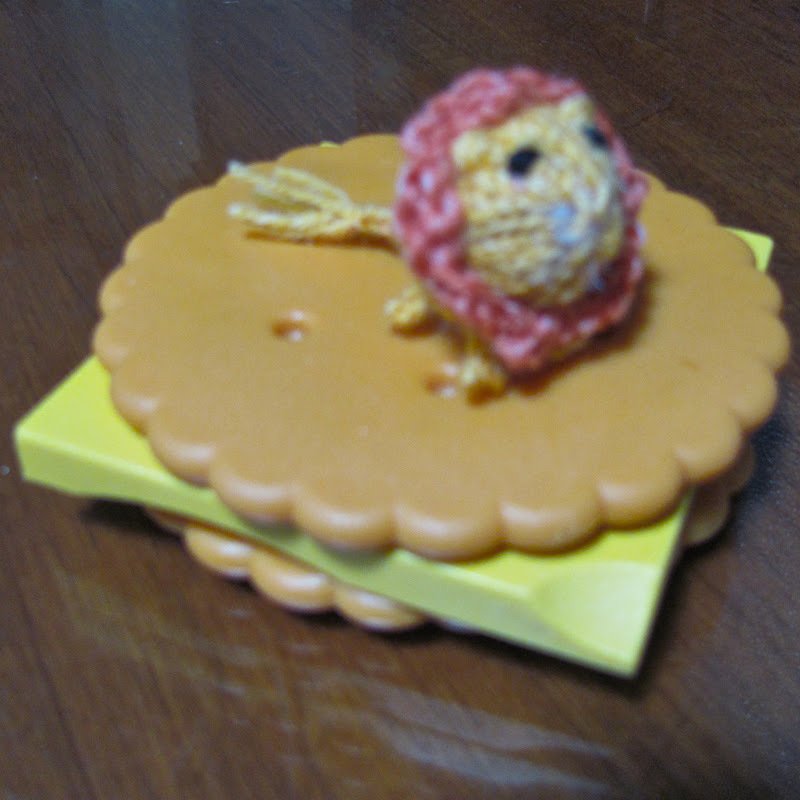 I did make the doll's person a mini lion ... just because. I think I caught some sort of must-make-dolly-costumes virus. 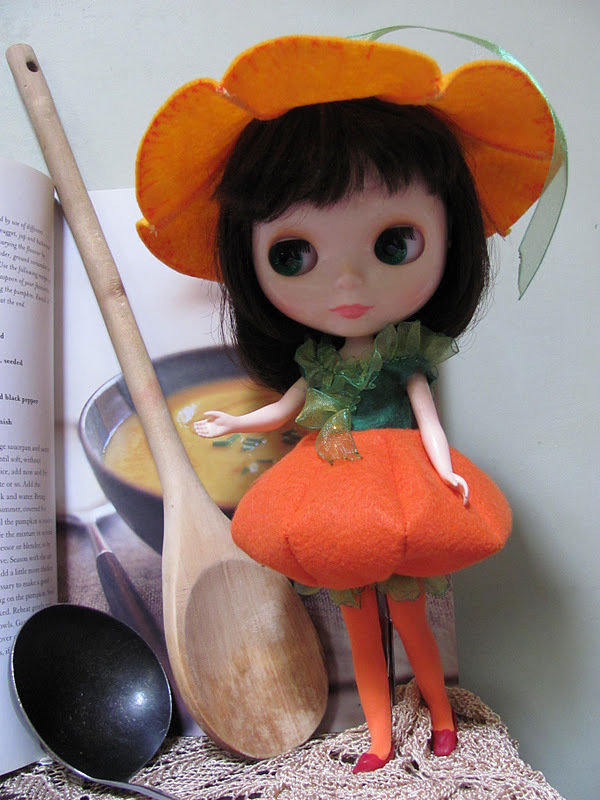 The WPWD's people had a photo competition, and the theme was Orange. And made a pumpkin costume - mostly felt fabric with some green ribbon left over from the other costume. You can see all the fantastic entries for this competition here. 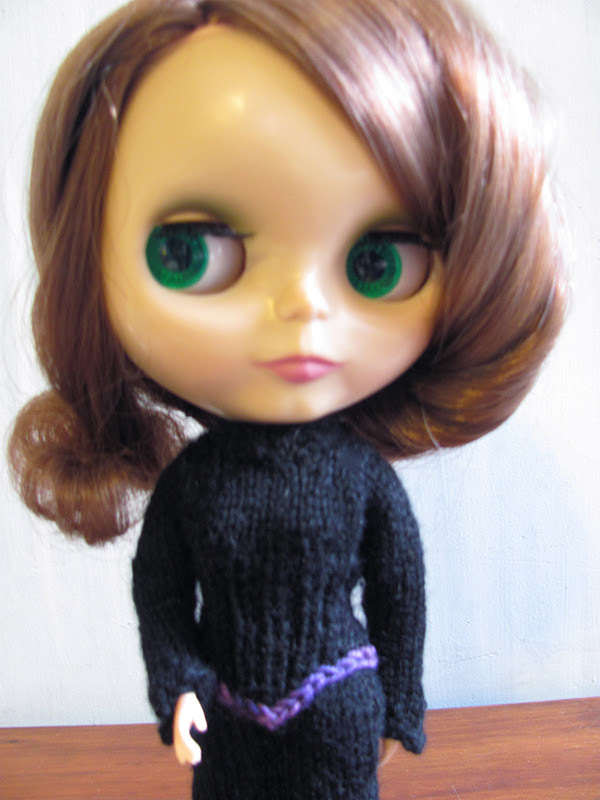 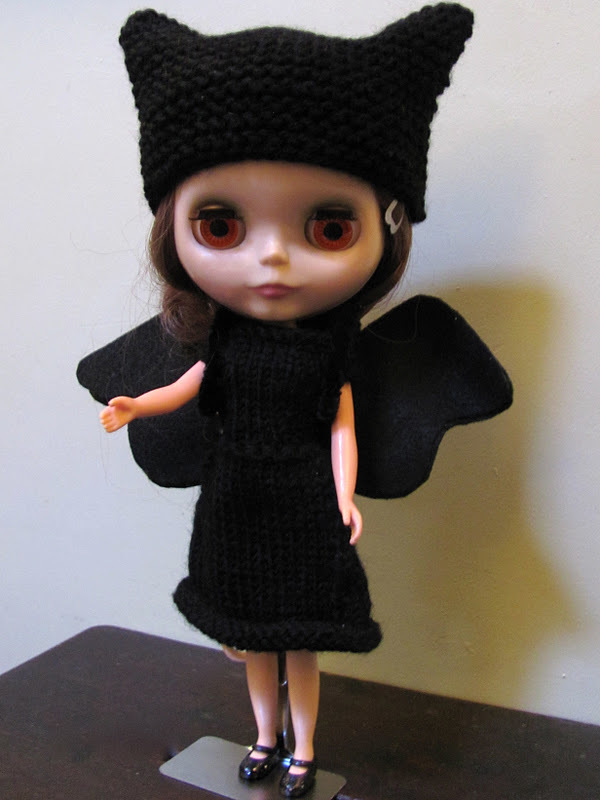 Meanwhile I'd been busy knitting a Morticia Adams style dress for Lillian. 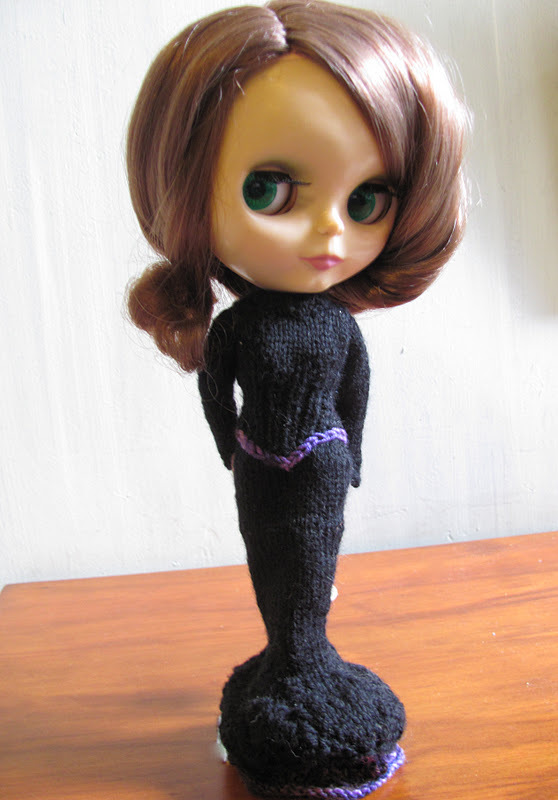 The girdle and under-flounce are actually purple (my camera doesn't like purple) and the dress is adapted from my "recipe" (available for free at the top of the page). Lillian asked for a nice dramatic cape to go with her dress. 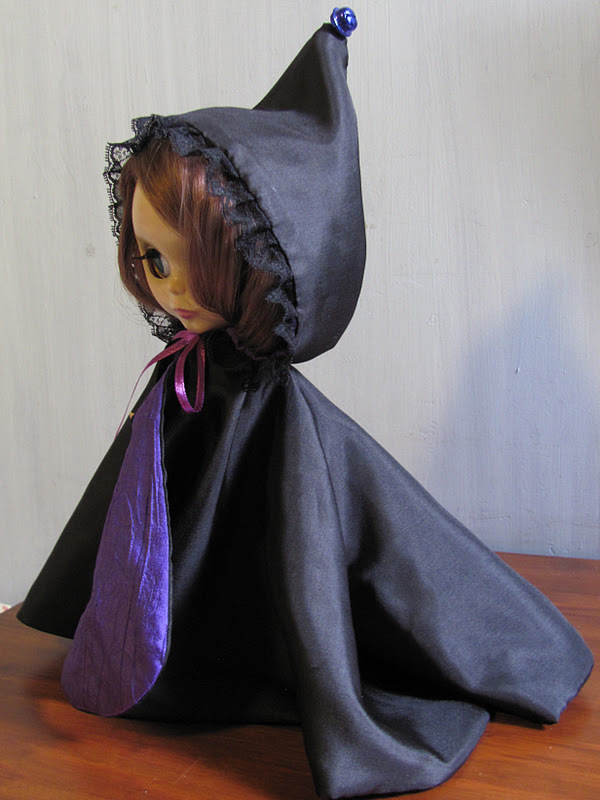 Full circle with purple lining and a nice big hood ... so she can be romantic & mysterious. 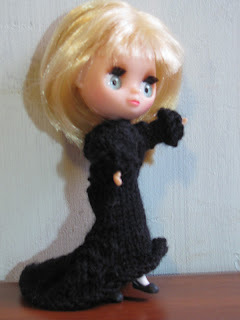 Bird likes her long black dress - it makes her feel quite Grown'd Up. Well the dolls got to show off their outfits at the WPWDs Halloween meet. This was just wonderful fun - I got to meet some people who are just as crazy about their dolls as I am! 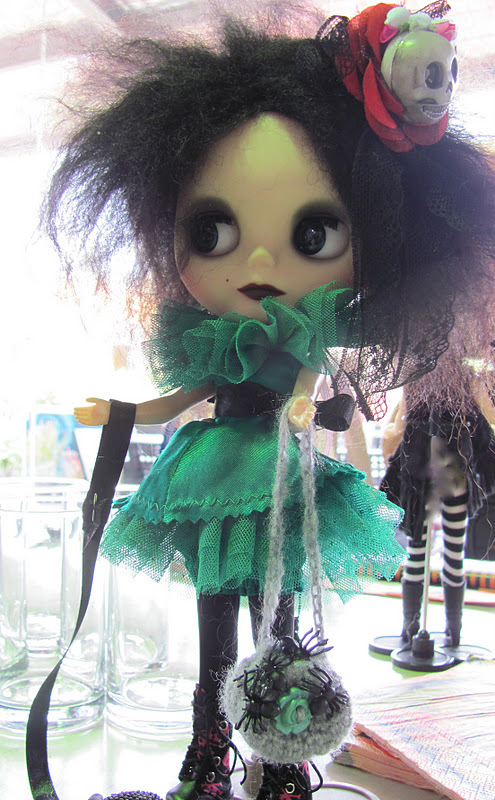 And there were so many gorgeous dolls!! 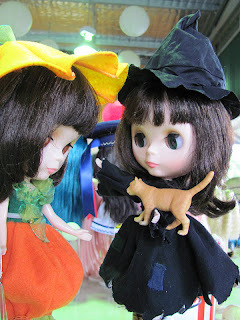 Audrey met another Simply Chocolate - Evie was wearing a lovely witch costume and she had brought her cat. 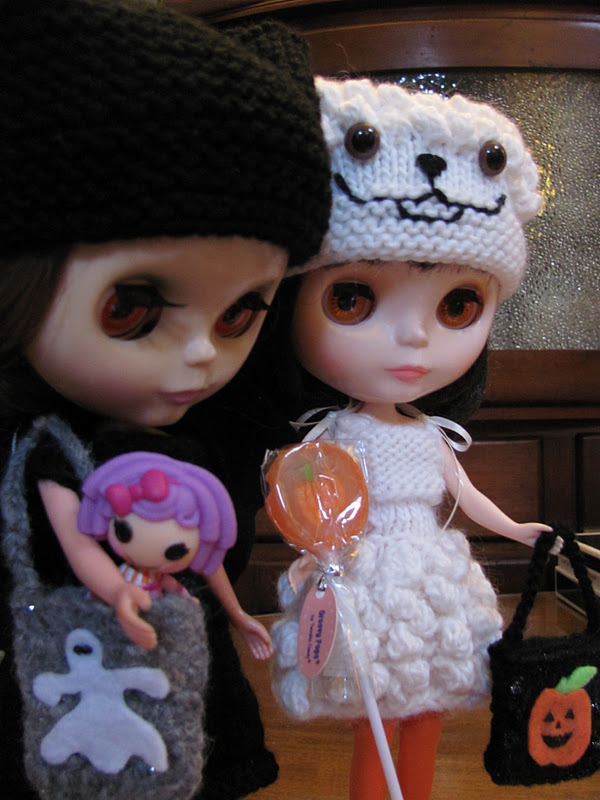 Audrey and Evie had a lovely time. 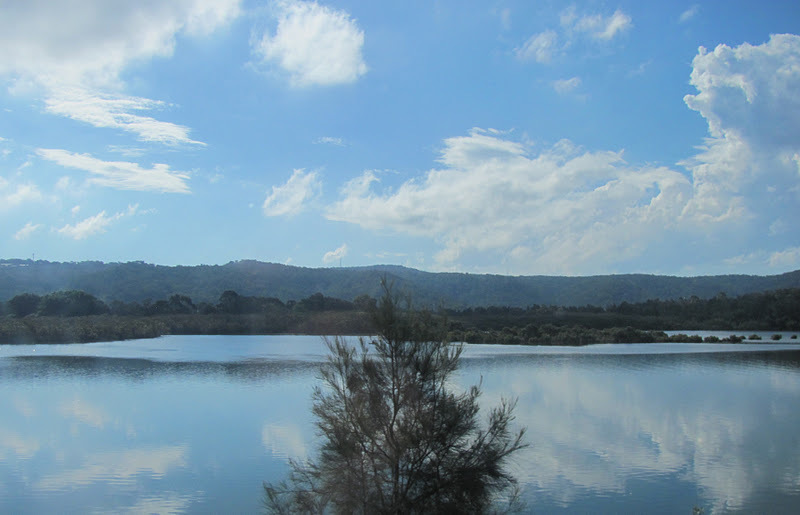 The meeting was on the Central Coast, past the Hawkesbury River - I took the train there and took some photos out of the window on the way. 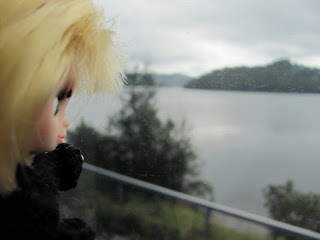 The train-line goes really close to the river. 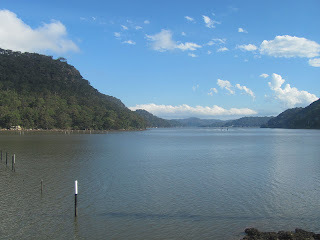 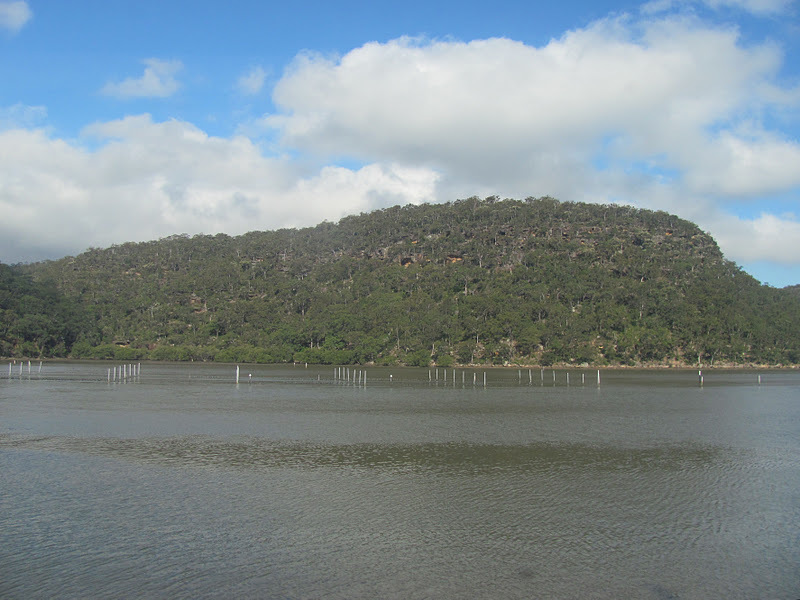 The Hawkesbury is quite shallow in many places and there are oyster leases. Bird enjoyed looking out the window! 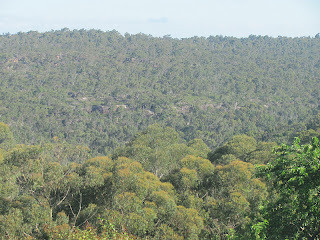 The colours of the Australian bush - those olive greens. 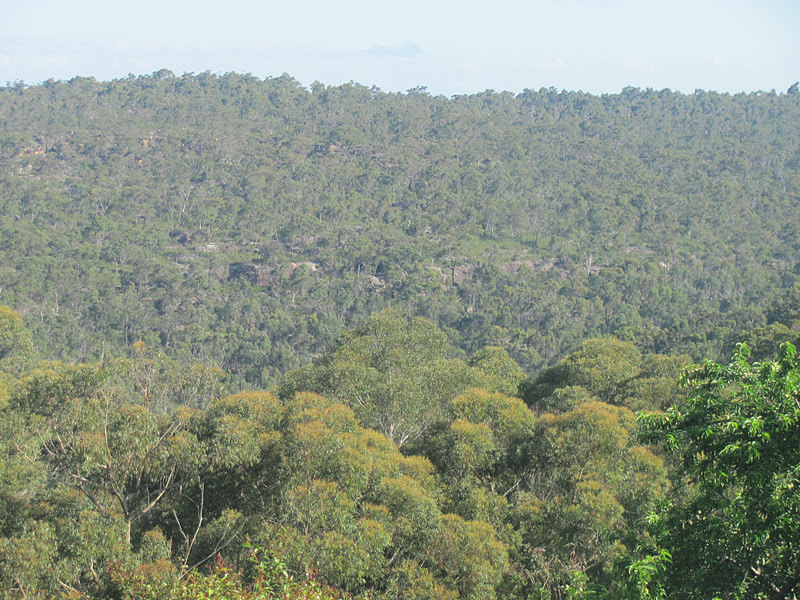 The very green tree in the bottom RH corner is a non-native, such a contrast! 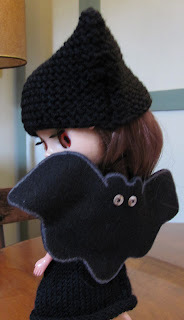 Oh, I love the capes!